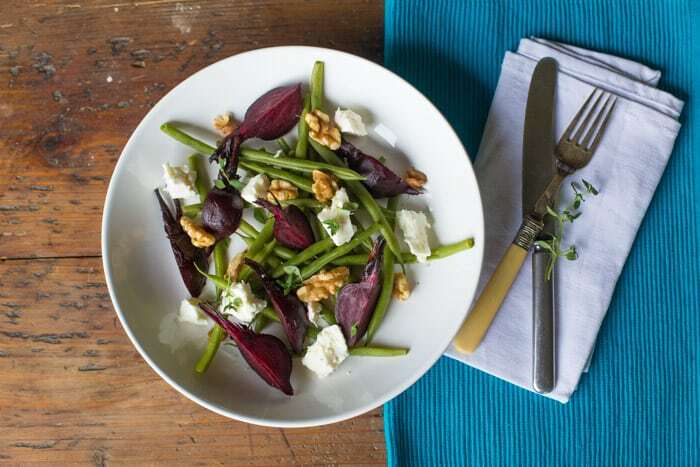 This Roast Baby Beetroot Salad is jam packed full of complementary flavours that’ll liven up your lunchtime. Sweet and earthy beets, cool and salty feta and the slightly bitter walnuts pack a real punch when combined together into this easy yet impressive salad. I love me some baby beetroot! So sweet and tender and juicy, they are little orbs of delight. Roasted in a little oil with a few sprigs of thyme, they are perfect served alongside a roast, cold the next day in a cheese sandwich or as we’ve done here, served warm with feta, walnuts and green beans. Before roasting use a nail brush or veg scrubber to work around the stalk end as teeny bits of grit are prone to hide here, and I don’t know about you, but grit between my teeth is enough to put me right off my food. If the leaves are attached, snip them off leaving an inch or two of stalk. The leaves can be steamed or stir fried to be served with the salad, or kept in the salad drawer of your fridge until you are ready to use them. What flavours do you like to pair with beetroot? Preheat the oven to 200/400/gas 6. Scrub the beetroot and remove the leaves if there are any. Pop into a roasting dish, tuck in the fresh thyme sprigs, drizzle with a little oil and sprinkle with a pinch of salt. Roast for around 30 minutes or until the beets are cooked through. Once they are cooked, removed from the oven and don a pair of marigold gloves. Gently scrub at the skin of the beets until it comes away. Aim to leave the inch of stalks connected, just try and remove all the skin. Meanwhile steam the green beans for 4 - 5 minutes or until just cooked. With your gloves still on (you'll thank me later) quarter each beetroot lengthways, cutting through the sprouting top so each quarter has a little stem attached. If your beets are really tiny, then feel free to keep them whole. 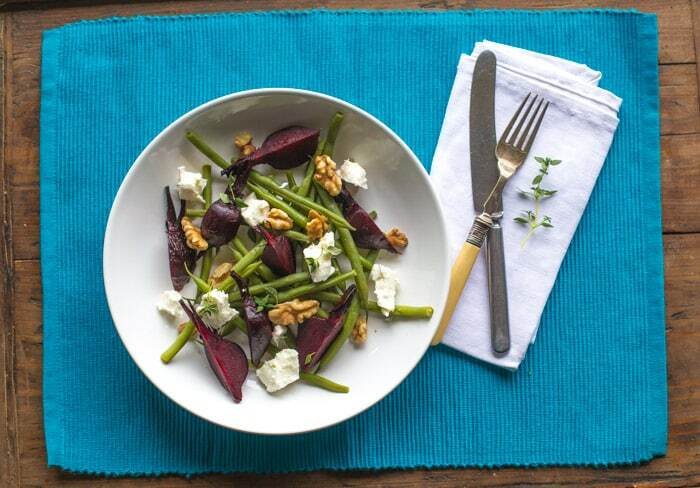 In your serving dish, layer up the green beans, beetroot and walnuts and crumble over the block of feta cheese. Finish with a couple of sprigs of fresh thyme and you're go to go. Please note: if you are lactose intolerant, be sure to read the feta cheese packet before buying. Some of the cheaper brands are made with cows milk, whereas most dairy free folk can tolerate traditional feta cheese which is made from sheeps milk or a mix of sheep and goats milk. I can tolerate both of these milks, so do give them a go if you haven’t tried them through fear of getting ill. Inspired to buy up a big bunch of beetroot next time you’re out? Check out these recipes from my fellow foodie bloggers for even more inspiration! I love, love, love the sound of this! One of my favourite things of Autumn is the appearance of beetroot in my veg box. oh that looks quite delicious. 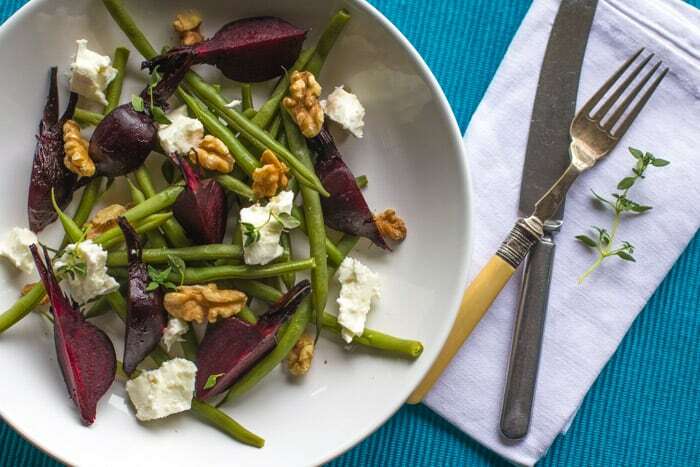 I am a fan of beetroot with feta and walnuts, but I’ve never tried using baby beet. Looks quite lovely! Ooh yes, my kind of salad for sure. Lovely complimentary flavours and textures. I love beets, but as CT is averse, I tend to eat them with cheese on toast. I love beetroot and cheese – it’s such a perfect combination. 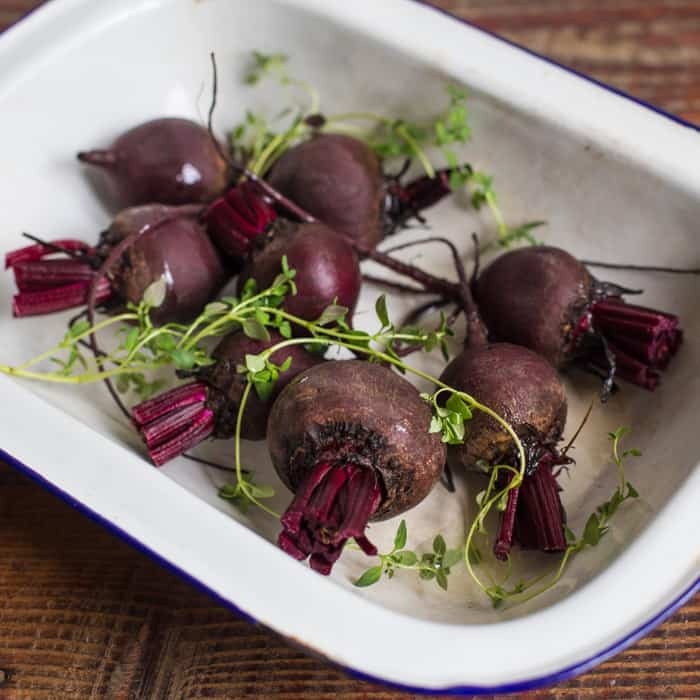 You can get some beautifully coloured beetroot as well – the golden ones are so pretty. Thanks for linking to my recipe – really looking forward to trying yours. I am falling more and more for beetroot especially when grated raw and straight into some salad. I’m another beetroot fan, whether the baby ones or the great big ones that I like to bake slowly in the slow cooker. Your flavour combination looks delish.